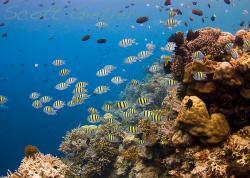 Truk lagoon, also known as Chuuk lagoon, is the shipwreck capital of the world. If you are a lover of wrecks or history, a visit to Truk Lagoon is a must. Don't think it's just about shipwrecks though, there's beautiful soft coral growth on every wreck, and even people who are not wreck enthusiasts will find it very cool to see bicycles, pick-up trucks, tanks, torpedoes, guns, airplane parts, engines, and gas masks from World War II underwater. 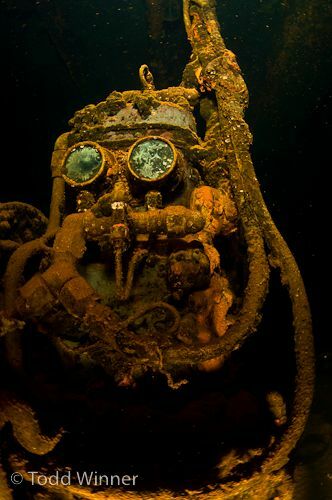 Truk lagoon is a lot of wreck diving. 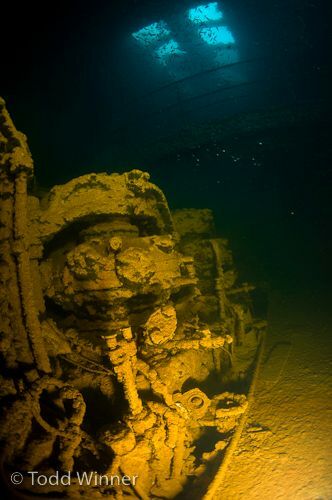 The tops of the wrecks are usually at 40-60ft, with the bottoms at 100-160ft on a non-tech diving trip. 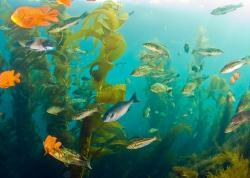 Most diving is done at 80-100ft depth on 32% nitrox. Different wrecks are known for different artifacts, and your dive guides will give thorough briefings for each wreck. The San Francisco Maru is the most famous wreck, because of it's 3 tanks with guns on the deck, but it also very deep, 170 at the bottom. 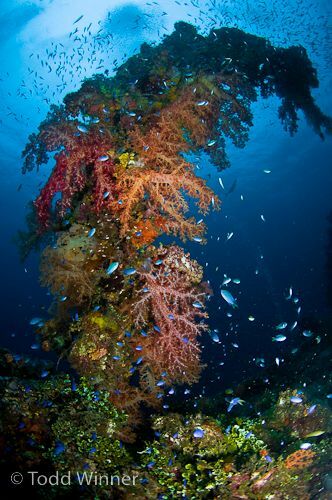 The Fujikawa Maru is also a favorite wreck to dive, filled with fish and corals. 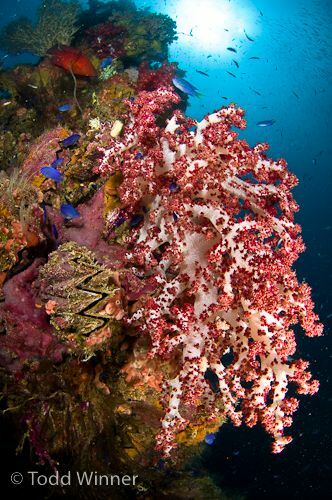 Each wreck has beautiful soft coral growing on it in many places, with many schools of small fish swimming around. Reef sharks occasionally pass by, but are difficult to photograph. 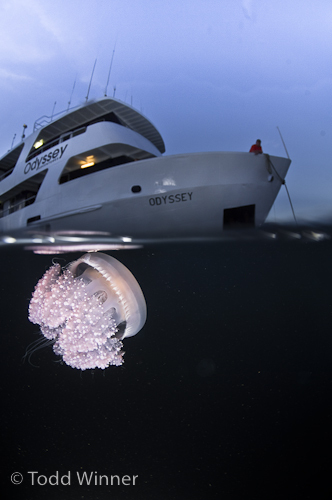 On one trip in October, different species of large, beautiful jellyfish were passing by on every dive. You could easily spend an hour on every safety stop photographing these jellyfish - read more about how to photograph jellyfish. Macro life is not as good as other places, but every wreck does have macro life on it such as nudibranchs, anemones, porcelain crabs, shrimps, and small fish. Rainy season is April to December, dry season Dec to April. Any time is fine to go though, vis is always good and rain is intermittent. 81-84 in the winter, 83-86 in the summer / early fall. From the us, fly to Hawaii -> Guam and then land in truk. On a 7 day trip you'll get in 5 1/2 days of diving. The lagoon is large, but motoring on a liveaboard is done during meals or at night so you can get lots of diving in. 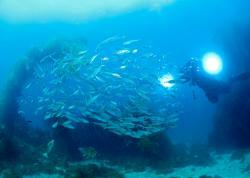 5 dives total, including a night dive is the norm. A Tokina 10-17mm fisheye lens is ideal for the wrecks, although you may want a rectilinear lens like the sigma 10-20mm if you don't want curved lines in your photographs. If you go inside a wreck, for good photographs you must have excellent buoyancy control and be able to control your breathing. Kicking the sides of the wreck or having your bubbles rise up and dislodge silt can quickly ruin an area for photography. 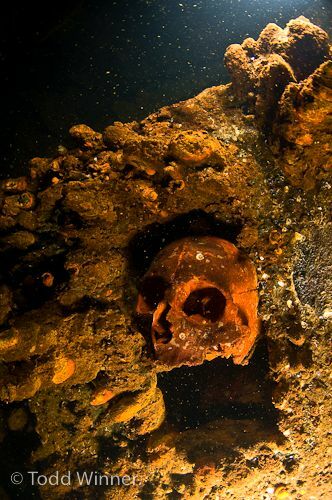 Some artifacts like skulls, toolboxes and lanterns are located deep inside wrecks. Guides can bring you inside to find them, inquire at the resort or boat. Of course this is at your own risk because you will be dependent on the guide to bring you out.